Lacquered kitchen doors now available! Flat pack kitchens offer DIY kitchens, doors, cabinets and accessories delivered to your door - fast! If you are confident with DIY and want to put your own DIY kitchen together, you've come to the right place! Whether it is replacement kitchen doors, cabinets or the complete units, we have them all available to buy. We use Pronto by BA, a fantastic selection of vinyl wrap and lacquered doors in a variety of styles and finishes. Paired with the innovative ClicBox flat pack carcasses, you can have everything you need to build your brand new kitchen. The kitchen cabinets are available in one of four colours. White, Ivory, Grey and Lissa Oak. 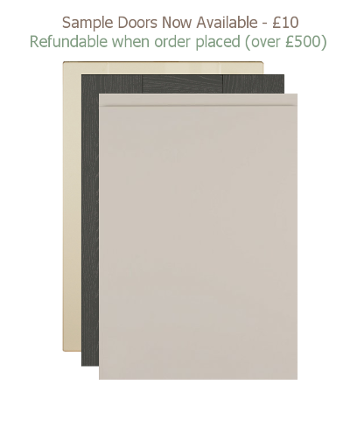 These kitchen cabinets can be bought on their own or paired up with one of our variety of replacement kitchen doors. To make things a little simpler we have also paired doors with cabinets for you, so you can choose complete kitchen units. The units include cabinets, doors and any required hinges and wall plates. We have sample doors available in every finish. Please click on the sample doors section. All doors are £10 each, refundable on kitchen purchases over £500. If you have any questions about any of our customers please don't hesitate to get in touch with our customer service team on 02920 007 948.